Of all the hundreds of microgenres that make pop the funnest kind of butterfly collecting, perhaps the greatest is Swedish Reggae. The first person I heard talk about Swedish Reggae was Stephin Merritt of the Magnetic Fields at the end of the 90s, but by then its heyday was long gone. It was a holiday romance, opposites attracting, never really meant to be – a union of the sun-hardened authenticity of reggae and kitschy Scando popcraft which couldn’t truly produce anything lasting, or could it? In fact, now I think about it, maybe there only ever was one Swedish Reggae song – this song, “All That She Wants”, so startling that you imagined a whole style around it. The sound of “All That She Wants” is disarmingly simple – high, clear, piping synths over a basic skank – but also quite perfect. It’s a cooling sound, it makes the rest of pop sound busy and overheated. As the song so poetically puts it, “It’s not a day for work – it’s a day for catching time”. Not just time, though – with its gulf between high and low end the Swedish Reggae sound is all about creating space, and the protagonist of “All That She Wants” demands that space – she’s an utterly autonomous creature, an apex predator of romance, lonely like a polar bear is lonely. She gets all that she wants, and all that she wants is (maybe) you (for the moment). It’s a lovely touch to have her in the song only as a reported presence – her “baby” isn’t singing, nor is she, just an unplaced narrator, a witness to her as an event as much as a person. …and this is yet another one that I first heard in my Great Late 80s/Early 90s Musical Discovery of January 2004, as mentioned in previous entries. For a band that had hits all through the decade I somehow ended up completely missing them at the time, perhaps because their biggest hit-making years were just before my musical memories begin. I still have one memory attached to this though – my workplace’s Halloween quiz night in 2008 had a ‘Guess the song from the intro’ round, this being one of them. When they revealed the answers at the end and played the rest of the song, the entire room burst into a massive singsong of EVERY SINGLE LINE, right up to the first chorus. Fifteen years later and it had clearly stuck in everyone’s minds! 8 I agree with, I’d probably give ‘The Sign’ a 9 but sadly we won’t be seeing them again. They all share a similar sort of Pop DNA and arguably define the pop landscape within their own periods in time. The explicit connectedness of the tracks I mentioned with ATSW acting as a kind of fulcrum point seem to suggest one informs the next and so on. This sort of thing happens in Rock quite often, but in pop it seems less obvious. I’m sure a lot of the commenters here will go “Well, DUH!”, but I’m starting to notice this effect more often since contributing to Popular. #13 – That would have been 1981, and it’s probably the only reggae song in the world to feature an accordion solo. Though you can’t really lay all the blame at the Finns’ door since it was written by British expat Jim Pembroke, as was also the case with the 1982 Finnish entry Nuku pommiin which received the royal nul points treatment. Outside of these two, Pembroke (mainly known for fronting prog rockers Wigwam) has written tons of great songs – believe it or not. I missed Ace of Base the first time around; I don’t know if there was any particular moment when I went back and caught up on them. They seem generally beloved by people my age (30) as something most of my peers except me got really into as kids and then quickly suppressed but never abandoned. Baffling really – – “Don’t Turn Around” is pretty good, “The Sign” kind of short on ideas but catchy as hell… but to me “All That She Wants” is a great melody and fairly compelling vocal, trapped in a clattering, distracting production. I can usually bracket this kind of thing as a period/genre piece – they all sound like that so it’s a bit lame to really harp on the beats, but man do they not serve the song. If it’s meant to be wistful, get all that crap out of there (especially the goofy synth sax!) and if it’s meant to be driving get a rhythm section that doesn’t sound like it came free in a box of Cheerios. As it is, the song just kind of minces along, making the vocals feel slower and more half-hearted than they actually are. This song is in a minor key all the way until the last verse, when it modulates to the tonic major. The musical equivalent of a happy ending. #35 Not quite. The intro and choruses are minor, then it modulates to the parallel major the start of both verses (the verse melody never lands on the third so the change can go unnoticed), but there are little differences. The shift from F# major to F#minor under the line ‘It’s a day for catching time’ (or whatever) is not replicated in the second verse, which makes the whole verse ‘feel’ more major key as the tonal ground is more stable! Sorry, that’s unclear. I mean the melody sung over that first chord in the verse sequence (c# major) doesn’t land on the third, which is why the change from minor to major may go unnoticed..
@#34, I guess I know what you’re getting at, but for myself I really like the drum machine and bass on this track and regard it as a cornerstone of the AoB sound (they used these same sounds and patterns on all of their early hits). It’s punchy but not at all pummelling if that makes any sense. In a way, I regard it as a useful update of the sort of driving but non-oppressive (non-drum machine) rhythm tracks that one finds on Evelyn King’s first album (Shame, The Show is Over, etc.) or even on Off The Wall. And it feels to me now about equally classic, and equally welcome when it turns up in mash-ups. Compare Miley Cyrus’s Party in the USA with its mash-up/reboot to the AoB back track from The Sign. @#23. I kind of had the same feeling but I’ve tended to put that down to just that AoB weren’t able to follow up this initial period of storming success with anything much (in the US at least). Apparently, I gather, this was because (A-singer and visual focus) Linn very quickly wanted out of the business (Agnetha squared?). I’ve only caught up with AoB’s later semi-hits (outside the US) recently on youtube and the sense of Linn shrinking away from the camera (and the music) in those vids is quite palpable and remarkable. I think my favourite of theirs was the more lightweight Life Is A Flower from a few years later. But the ambiguity of this gives it a faint but definite sinister feel. Does she want somebody else’s boyfriend or husband, or their actual baby? And she only wants another one of whichever it is, suggesting she tires of them quickly. What happens then? The vagueness of the lyrics and the menacing feel of the music gives the whole song the air of a thriller. What was it about Scandinavian pop groups that enabled them to produce such hummable darkness? #37 Yes, there is quite an emphasis on avoidance of the 3rd. I seem to remember them doing a similar thing harmonically in The Sign (which is predominantly major). Ultimately this song with its production and melancholy could only be Swedish. I remember a ska-punk-lite version of it done by their fellow countrymen The Grass Show a few years later. Paved the way for an influx of Scandinavian bands Stakka Bo, Cardigans, Wannadies etc who for me seamlessly fitted in with the Britpop scene despite not being British. This is a 10 out of 10 for me. Pedant’s point: isn’t the lyric “catching tan” rather than time? The verses are a lot better than the chours I think. I would prefer that chilly morning after vibe to stay throughout the whole song. The chours has a forced Saturday morning kids show bounciness that doesn’t quite balance with the rest of it and the lead singer has a voice even more uncharismatic than Andy Bell. What really dates it are those synthetic horns. Evidently a similar preset to the one the Sugababes used for the ” brass section ” on their crappy (or rather even crappier than the original) version of Here Comes The Girls. The source presumably being a Tomytron keyboards for schools manual from 1980. I wouldn’t look back too favourably on Ace of Base. All their other songs just seemed like variations on this one. I loved this song at the time. And I still love it. But it has a lot of Tubthumping about it – it didn’t represent the rest of the bands releases as I heard them in Australia. I remember being very disappointed by every other single the band released. This was special at a time I turned off pop music – I mean how many songs have a recorder on them? Later I would filter it through a ska vibe – I recognised the reggae vibe for what it once as soon as I had a toolkit for thinking about reggae and ska. I liked the song even more. And stil do. Other examples of Swedish reggae: T-Spoon, Mr President. Nothing will convince me that this song isn’t about a woman trying to get pregnant from a one-night stand. What is the alternative reading? Ah, Ace Of Base. I read a great quote once that these guys were huge in America (a whole slew of complexities over retitled and versioned albums resulting in, I think, an album called Happy Nation (US Edition) and the same album also called The Sign) – right up until the moment that Americans realised that they weren’t actually an abba reunion. yeah, see #7, this has already been touched on.. Loved this then, still love it now. Still remember my first exposure to this via a hits compilation CD brought back from Europe by a college friend. I eventually bought the CD from him (it also included songs discussed here by 2 Unlimited and Shaggy, among others). 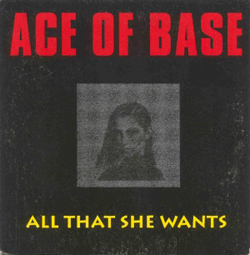 Ace of Base never quite reached these heights again with me, although I do own both The Sign and The Bridge albums. Notably “The Sign” is probably my least favorite track on its eponymous album – it got just a little overexposed in the US. Not “All That She Wants” though, even though it reached #2 on the Hot 100, blocked by a huge slab of Meat Loaf. 9…9.5…oh what the heck, TEN from me.